anywhere that "shop air" is available. They handle loads up 4000 lbs. 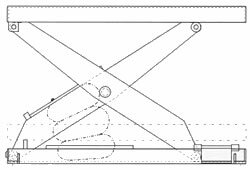 risk of hydraulics or process contamination. Shipped complete and ready to operate, requiring connection to an air supply of at least 80 psi with 80 cfm, free air. 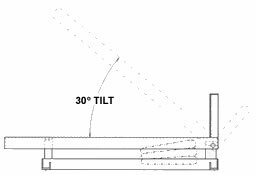 tilter; two hand valves on a common pedestal for a lift and tilt. User must provide the air supply line. 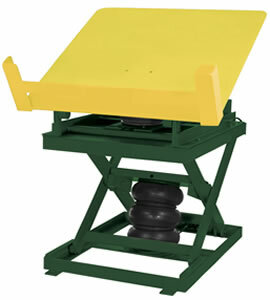 Load dampener is included to eliminate platform "bounce". Note: Price includes installation of bellows accordion skirting. Note: One valve needed for each lift or tilt. 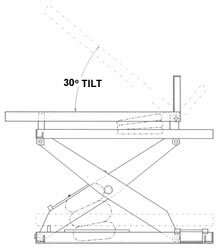 and Tilters from your source for material handling equipment.